Canker sores are small sores that appear on the inside of the mouth, especially the cheeks, the inside of the lips, and the tongue. 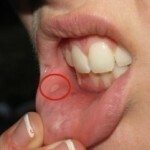 A canker sore appears as a round white spot with a red border. They’re also called aphthous ulcers. Rarely, they may develop on the gums or on the roof of the mouth. Small ones are about 1 to 2 millimeters across and often come in groups. Large ones have an irregular shape Small canker sores disappear within 14 days and don’t scar. Large ones are less common, take weeks to heal, and can leave scars. Canker sores aren’t contagious like cold sores are. Women statistically suffer from canker sores more often than men. Canker sores are typically seen in people between the ages of 10 and 40, although they have been known to show up at any age. Doctors don’t know exactly what causes canker sores. They may be hereditary, but doctors have not figured out exactly how people inherit the tendency to get them. Researchers think they may be an overreaction to the Streptococcus bacteria, because the bacteria are often found in the canker sore. Once you better understand what some of the known causes of canker sores are; then you can begin taking steps to avoid the causes. Immune System: We all know that our bodies are effective in fighting off viruses that can cause this condition. However, if you are suffering from cold sores; then chances are your immune system is unable to fight off certain virus. Stress: They may also be brought on by stress – for example, many students get them during exams. This has been one of the leading factors for almost any type of illnesses or diseases that our bodies acquire. Allergies: They may be associated with an increased risk for canker sores. Many of us are unaware that some of the foods or medications may be triggers for canker sores or act as nutrients for the Streptococcus bacteria. Hereditary: If canker sores run in your family then you may be more prone to getting infected with the virus. Sun: Believe it or not the sun has been known to cause these things to pop up as well. Toothpastes: Certain brands that contain sodium lauryl sulfate have been responsible for this condition as well. Menstrual period: Canker sores often occur near the time of a menstrual period. Lack of cyanocobalamin (vitamin B12), folic acid, or iron. People with canker sores often have small injuries from dental injections and toothbrushes in the lining of the mouth.